Trump’s announcement regarding the tax cut left impacts on EURUSD; also this pair will be under the influence of the ECB rate announcement. 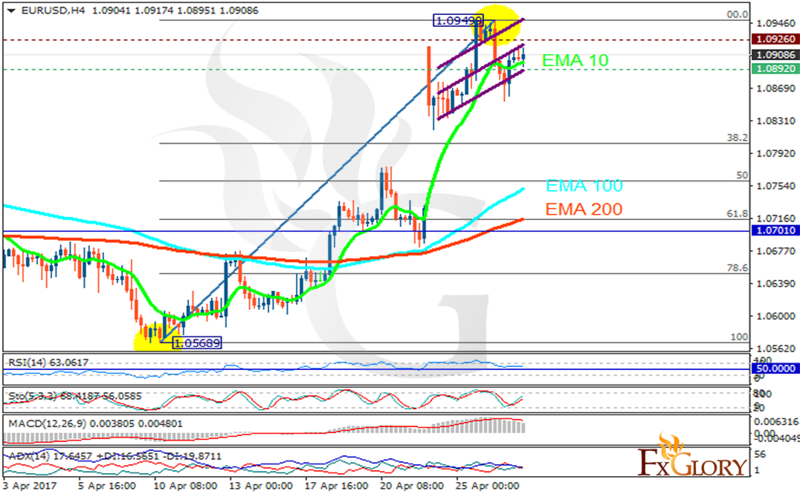 The support rests at 1.08920 with resistance at 1.09260 which both lines are above the weekly pivot point at 1.07010. The EMA of 10 is moving with bullish bias along the ascendant channel and it is above the EMA of 100 and the EMA of 200. The RSI is moving horizontally in overbought area, the Stochastic is moving in high ranges and the MACD indicator is in positive territory. The ADX is not showing any clear signals. The resistance level breakout will smooth the way for further growth targeting 1.1 area otherwise the price will fall towards the 61.8 level of Fibonacci.